Yann Martel’s Life of Pi follows the lengthy journey of a young man and a Bengal tiger as they traipse across the ocean in a lifeboat. Before director Ang Lee took up the mantle, many considered the book to be beautiful, but virtually unfilmable. If there is a will, there is a way, and Lee discerned very adeptly how Life of Pi needed to be told onscreen. Lee’s version works because it gives us the chance to hear Pi’s story told from the mouth of an older, wiser version of the young religious believer, who plays a smaller role in the books. It works because it takes all of the visions readers have created in their heads while reading Life and Pi and makes those visions bigger, bolder, and brighter. It works because it streamlines a lengthy tale without making us feel as we are missing anything key to the narrative. 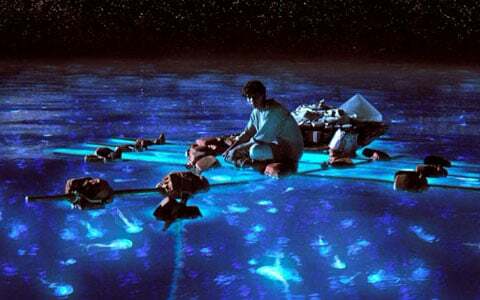 As a film, Life of Pi is a visual masterpiece, but it isn’t better than the book. 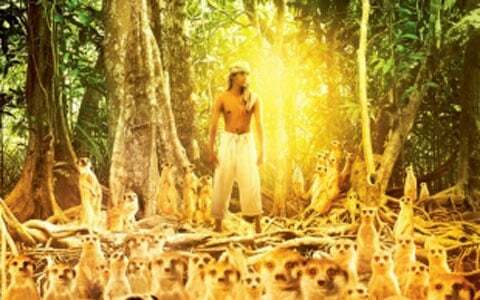 Following are the 9 biggest changes I noticed in my screening of Life of Pi. Feel free to remark on any I may have missed. 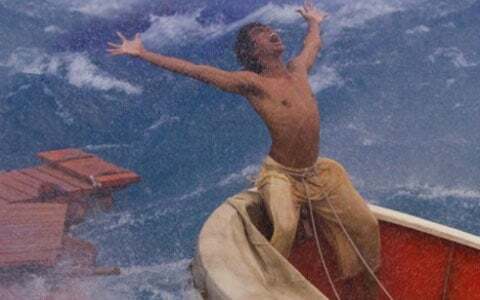 There are many spoilers in the Life of Pi book to movie comparison. Do not jump in if you have not seen the film. Most of the lengthy intro in Martel’s book is shortened in the film. The tale Pi gives of his childhood is still one of changing his nickname, living in a zoo, and finding religion. However, many of his teachers and mentors (and even some of his zoo knowledge) are cut out of the narrative for the sake of maintaining the love and lessons Pi learns from his family. Pi is old enough in the movie to have a love interest. In the film, Pi is too busy thinking about the girl he met in a dance class to even notice the troubles his father is facing with the zoo. This makes Pi’s travels away from his home and India far more of a painful separation. The film shows Pi first coming to an understanding of religion from his mother, who is portrayed as far more religious in the film. She supports his quest to learn about different religions and seems to have a special place in her heart for her younger son. The closer relationship the two share in the film gives more meaning to the second tale Pi utters to the Japanese men who come to see him after he washes ashore. Pi never really manages to tame Richard Parker. In Martel’s book, Pi uses his zoo knowledge and understanding of circus practices to mostly train the large adult Bengal tiger. In the movie, while the boy and the tiger maintain a wary distrust of one another, Pi never truly feels in control. The biggest moment that defines Richard Parker and Pi’s relationship is the tiger’s prusten noise—which signals non-aggression--and that moment is completely gone in the film. There is a lot of suffering in Life of Pi and merely a few moments of beauty and glory--like in the lightning storm that appears in both the book and the film. However, Ang Lee’s vision of Pi’s journey is breathtaking, supplemented by moments of true beauty that—almost—make Pi’s journey worth it. The best example of a scene standing out far more for it’s beauty in the movie than the book is probably Pi’s introduction to the whale. Turtles are never an easy catch in the film. Life of Pi earned a PG rating, and this means a good percentage of the suffering Pi endures is cut down or made to seem somewhat more tame. We aren’t forced to see as much of the hyenas antics when Pi first finds himself on the lifeboat. Later, while he and Richard Parker take down some fish, Pi doesn’t take down turtles to use their shells as shields or to dry their meat in the sun. There’s enough suffering on Pi’s end of the film that we don’t need to hear him daydream about sucking the marrow out of bones. Pi does not meet another blind sailor along the journey. In fact, Pi never even goes blind. 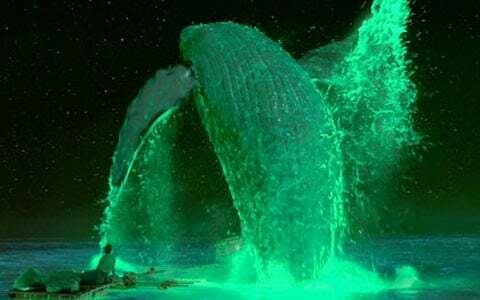 Instead, when Pi attempts to ‘talk’ with Richard Parker, Ang Lee uses the narrative space to show us Pi staring into the deep, black ocean in order to show us a philosophical journey reaching the depths of the universe, and showing the audience the relationship between fish and mammals, and even a memory of the sinking Tsimtsum. Pi and Richard Parker only spend a day on the carnivorous island. In the book, Pi and Richard Parker linger on the island for a while longer. The horror factor is still there when Pi finds the human teeth embedded in the plant. However, for the sake of narrative flow, the boy and tiger do not spend so much time on the island and are not able to fully replenish themselves. Pi relates the second tale to our author, and Lee uses that as a springboard to show the scene between the castaway and the two Japanese men who come to determine why the Tsimtsum sank. Ending with Pi and the author in Pi’s living room helps to bring the tale full circle. Pi and the author begin rehashing the journey together and they end the story together. It’s far more comfortable than simply tacking on Pi’s more earthly tale, as the book does. 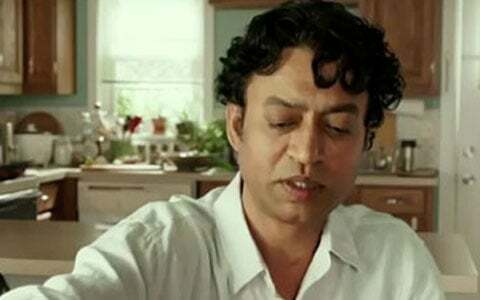 Most of the changes made in the Life of Pi movie were put into practice in order to cut down on time and help the narrative to flow better (and maybe also to keep the rating at a family friendly PG). While most of the changes work within the confines of the film, viewers are missing the intimacy of the book. One of the greatest privileges of reading is being privy to Pi’s thoughts as a thinker, and there would have been no way to forge that communion onscreen. Instead, we get beautiful cinematography. It’s lovely, but it isn’t intimate.